The usual culprit for problems such as foundation cracks is moisture. Whether the downspout on your roof is dropping water too close to your foundation or the wet soil around your home has pushed against your walls, water is an enemy to your home’s foundation. When the soil around your home gets saturated, it pushes against your walls and causes cracked or leaning walls. Because the foundation walls are key in supporting your home, foundation cracks should be repaired as quickly as possible. Don’t make the mistake of allowing these problems to sit around and get worse. We can assist in any foundation cracks Kansas City repairs you need. We can help you learn what to watch for and how to get cracks fixed fast. 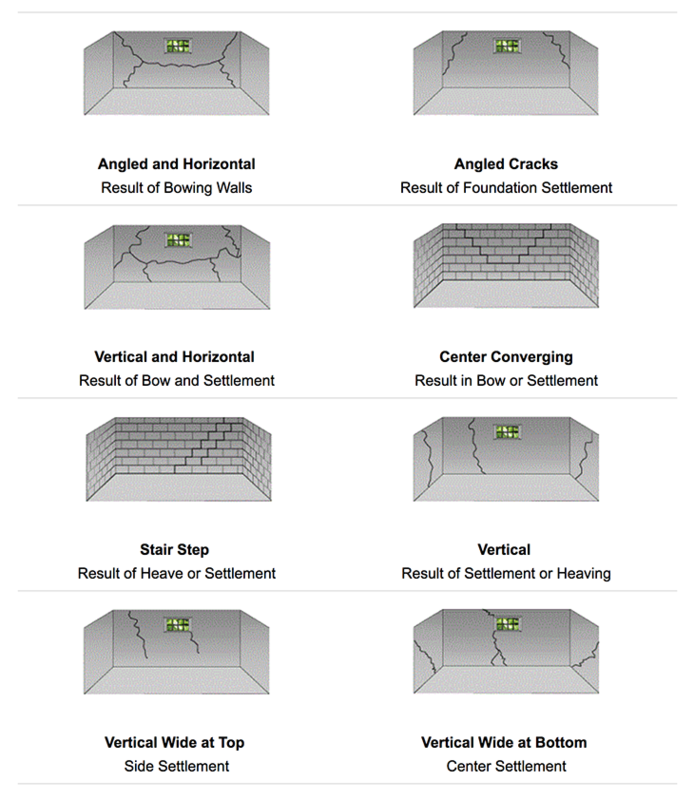 There are multiple different solutions for foundation cracks, from underpinning to helical anchors. A key part of the repair is preventing the problem from occurring again. This usually entails basement waterproofing or wall crack injections. KC Pro offers both interior and exterior basement waterproofing systems, along with wall crack injections to prevent water from coming in. Underpinning can keep your foundation from slipping further and make it more stable, and helical anchors are available to relieve some pressure of the pressure on your walls from the soil around it. If a downspout or gutter spills rain water against the home, these forces will often combine to make more severe frost cracks appear on the garage side of the home. There may be less back fill against the front and rear foundation walls at the front of the garage. The decrease in back fill combined with an unheated garage may expose these building corners to more frost damage. Different types of basement cracks have different causes, our KC Pro experts know exactly what each type means and how to fix it. As you cans see there are many types of cracks, all with different meanings and solutions. You’ll want to make sure that you contact the best contractors in the industry to help you restore the integrity of your home.If your home has cracks in its foundation, give KC Pro a call today. We are your leading foundation repair service provider in the Kansas City area. We can provide a free estimate today, so you can rest easy that your foundation cracks won’t turn into foundation failure.